The Trump administration has signaled that it is willing to return to the heinous crimes of the past two decades, including torture and abuse, secret prisons, and extraordinary renditions. 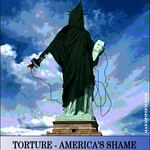 The appointment of Gina Haspel as the deputy director of the Central Intelligence Agency clearly indicates that the use of torture, including the use of waterboarding, which has been endorsed by the President, the national security adviser, and the CIA director, could once again be a major part of the U.S. campaign against international terrorism. Haspel was a central figure in the CIA's criminal behavior during the Bush administration. She ran the CIA's first secret prison in Thailand, where the brutal interrogations of Abu Zubaydah and Abd al-Rahim al-Nashiri took place. No intelligence was gleaned from the use of torture in these interrogations. When the head of the Counterterrorism Center, Jose Rodriguez, ordered the destruction of the videotapes of the torture, it was Haspel who drafted the cable that ordered the destruction. This was clearly evidence of obstruction of justice in view of the investigation of torture and abuse that had already begun. When former CIA director John Brennan tried to make Haspel the deputy director for operations in 2013, the chairwoman of the Senate intelligence committee, Dianne Feinstein, blocked her assignment. Currently, the Senate intelligence committee is under the stewardship of Senator Richard Burr (R-NC), who has blocked all attempts to circulate Feinstein's authoritative account of the CIA torture program. And the current CIA director, Mike Pompeo, does not even believe that waterboarding is an act of torture and has referred to those who conducted waterboarding as "patriots." Haspel was also a leading voice for extraordinary renditions, which involved the "capture" or kidnapping of individuals suspected of acts of terrorism. When the CIA concluded that these victims had no important information to reveal, they were turned over to foreign intelligence services, such as those in Syria and Jordan, that conducted their own methods of torture and abuse. Nevertheless, the New York Times refers to the promotion for Haspel as an example of the CIA's "ambivalent attitude" toward torture and abuse because former intelligence officials, such as intelligence tsar James Clapper and acting director Michael Morell, have praised the appointment. But Clapper has been known to lie to the Senate intelligence committee about the massive surveillance program of the National Security Agency, and Morell used his own book to lie about the so-called intelligence that was gleaned from so-called "extraordinary interrogation techniques." There is no ambivalence here. This is simply one more example of the CIA promoting those officers who committed crimes on behalf of the agency. The intelligence officers who were held accountable in the Inspector General's report on the 9/11 intelligence failure ultimately received promotions and rewards from the agency. The intelligence officers who participated in the politicization of intelligence in the 1980s similarly received promotions and rewards. And now we have another example of the "worst of the worst" at the CIA becoming the second most important official of our leading civilian intelligence agency. There is no better way to create cynicism within the intelligence community and the larger political community than to reward the very people who tarnish the moral compass of the CIA. The title character of John le Carre's The Honorable Schoolboy never wanted to deal with problems of ethics and morality. "Point me and I'll march," he said to spymaster George Smiley. "Tell me the shots, I'll play them," he added. Once again, the CIA is being led by officials who have never accepted or understood the Supreme Court's 2006 decision in Hamdan v. Rumsfeld that declared CIA's torture program a violation of Geneva Conventions. This decision should have made those who conducted torture subject to the federal War Crimes Act. Perhaps if former president Barack Obama had sought accountability and responsibility for the crimes of torture, then we would not be witness to the return of war criminals to positions of responsibility.